It's a honor to have Brian McLaren here today, posting at Paradoxology and responding to your thoughts and questions concerning his just-released book: The Last Word and The Word After That. This is a great opportunity to dialog with Brian about his book, so don't be shy (Chris). If you haven't read the book yet, you may want to go and read this excerpt. 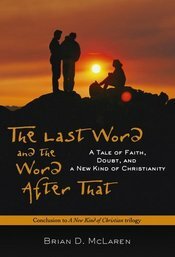 Hi, everyone - it's an honor to be your guest and have a bit of conversation about my newest book, "The Last Word and the Word After That." One of the discoveries that led to the book came to me several years ago, but I don't remember exactly how. I remember noticing that a number of Old Testament writers didn't seem to believe in an afterlife. It was obvious in Ecclesiastes, but you know - that whole book seems odd. It struck me in some of the Psalms especially. Then I noticed this lack of belief in afterlife in other places, and I realized that Sheol wasn't the same as hell. Then I began to notice that Jesus talked about hell a lot, which let me know that something must have happened between the end of the Old Testament and the beginning of the New. I was curious about what happened during that time. I think things basically stayed at that level of development in my mind until I was asked by Todd Hunter to prepare a talk on hell and heaven for a gathering of young Vineyard leaders. I had been thinking that I eventually wanted to dig into the subject; Todd's request forced me to do it sooner rather than later. That's when I realized that the picture wasn't nearly as simple or neat as I had been taught, and those investigations led to the book. I'd be interested in knowing what ideas from the book were most helpful or difficult for some of you - if you've read it, and if you have any questions you'd like me to address. I'm looking forward to hearing from several of you! I'm headed out the door to work, but wanted to get this quick post in to say how much I will enjoy reading the comments/conversations here when I have a chance later today! I've not read your book (yet!) but am looking forward to that as well. Thanks for your part in our Story! Do you think there is still an appropriate way to talk about hell without it meaning what most churches today intend it to mean. Would it still be appropriate to use it to imply God’s judgment on things that are unjust in today’s world, and things that are in need of restoration? If not, Do we need to find a different way to talk about the need for justice in the world? Brian - what sort of response have you had or do you expect from the Catholic community? In dialoguing with Reformed (Calvinist) friends, how can I discuss hell/heaven and get around their insistence on God only "saving the elect"? Brian, thank you so very much for all of your work, it has helped far more of us than you will ever realize. I have enjoyed certain things about each of your books, but what I really appreciate about this new one is that it is a topic almost everyone is interested in. Although I wanted to recommend the other 2 to others, not all of them would be helped by them. With this newest book, you don't really have to explain anything about postmodernism or emergent, you can just the book out. I recenly watched a documentary on the history channel on the history of hell,which really helped a lot to go along with your book. As you have discussed this topic before, what seems to be the biggest or most common criticism that you have received? Thanks again. As people grapple with various understandings of hell, justice, judgment, etc., how can we encourage them to embrace the inherent theological 'tensions' associated with these themes and avoid seeing them as being mutually exclusive? The book's character, Dan, (probably like most folks), tend to want things 'nailed down', yet scripture repeatedly seems to underline the mysteries of our faith, bidding us to trust more deeply. Learning from views other than our own goes both ways, right? So far (I just finished chapter 21), this book is a lot more challenging than the others I've read (the first two in this series and Generous Orthodoxy, which introduced me to you). You wrote that you'd like to know the most difficult and helpful (or in some cases, both, I've found) things we've encountered in the book. I am humbled to admit that Peter's use of Tartarus was a shock, and I found myself wishing that I didn't know that. Part of me would rather remain ignorant. In college in '92 I went through the whole "liberational theology" thing with Bishop Spong, et al, and it left my faith shattered. Then I got swept up into the "Word faith" movement and felt so secure again. Somehow I thought I'd found a balance, being an "open and affirming inclusive faith preacher," I guess. Generous Orthodoxy really gave me what Dan was looking for - something to call my beliefs, which I guess is still that modernist mindset of wanting to classify things. The Last Word is showing me how much even a lib-er-al like myself (as Neo would say) has so much that has been unexamined in my own life. Thank you so much for putting into words so many things we've struggled to express, and then challenging us to open even more doors. my friend desertpastor asked that I stop by and say hey. Hey. overall i've really liked your stuff. I must say I was surprized by Generous Orthodoxy (how much i really liked it) and a little disappointed in The Last Word. "But what about when Job says something about knowing that his redeemer lives and asserting that he will see God in the flesh?" Neil replied, "I think Job is saying that he believes he'll recover from his terrible illness and be vindicated--not as a soul in heaven but in this life, in his own body. At least that's how I see it." Is so incredibly lame. And that the bad part is that EC and POMO folk will now use Neil's answer to Dan as some sorta Dead Sea Scrolls way to explain away Hell. You usually talk about the question being more important than the answer, and that answers arn't all that neat. You must have forgot that pages 46 thru 50 something. Overall you say some really good stuff. But you need to be more careful. I mean some of the folk I know treat your words like they're inspired. If nothing else you are making Christians think. God knows that needed to happen. A: Shane - great question. Here's an analogy. We need to teach the passages of Scripture that talk about slavery. But every time we teach them, we also need to teach how they have been abused, and we need to give some narrative context so people understand what they did and didn't mean to their original hearers. I think we need to do something similar today regarding hell. Meanwhile - yes, we need to talk much more (in my opinion) than we've been doing about judgment - that we all are accountable to God, and that right now counts forever. Q: Brian - what sort of response have you had or do you expect from the Catholic community? A: Lorrie - the Catholic community has a wide range of people, just as the Protestant community does. There are "religious right" Catholics, left-wingers, liberals, moderates, etc., etc. I've heard from a few conservative Catholics who respond very much like Protestant fundamentalists. I've heard from many Catholics who appreciate what I'm doing ... one priest, for example, wanted to take a character from The Story We Find Ourselves In and create a parallel trilogy for Catholic folk. A: I think this is risky. For some reason, there seems to be a higher percentage of highly aggressive people among Calvinists (in my experience, at least.) More temperate Calvinists need to urge their brethren to become less pugilistic and more charitable, imho. But if you have Calvinist friends who are open to rethinking ... I'd begin with the idea of election. I discuss this a bit in "A Generous Orthodoxy." This radical rethinking of the meaning and purpose of election opens the door to a lot of other ideas. N.T. Wright writes helpfully about this too. Q: Brian, thank you so very much for all of your work, it has helped far more of us than you will ever realize. I have enjoyed certain things about each of your books, but what I really appreciate about this new one is that it is a topic almost everyone is interested in. Although I wanted to recommend the other 2 to others, not all of them would be helped by them. With this newest book, you don't really have to explain anything about postmodernism or emergent, you can just the book out. A: Thanks, Benjy. I saw that history channel show too - I wish it had been available when I first began my research - it was hard to find anything on the subject! The most common criticism ... "Who do you think you are to question something the church has held without diversity of opinion forever?" The assumption behind the question, by the way, is flawed - there has been, from ancient times to contemporary times, a persistent "minority report" on hell. I'm not the first and won't be the last. If we acknowledge this diversity and learn to hold both our opinions and our communities in love ... I think we'll be able to learn more, appreciate mystery, and maintain humility. A: Eric - ah, yes. This is the downside of education. It leads us into discomfort at times! Some describe the move from naivete to disillusionment to a new, higher, tested, wise simplicity (the second naivete). I hope you'll find a straight path to the second naivete as you continue to pray, think, dialogue, etc. As an analogy ... I have an oft-quoted article that talks about Dorothy and the Wizard of Oz. This doesn't imply that I believe they are real historical people, right? Can the Bible writers similarly refer to stories or concepts from their times and not be expected to be affirming of their complete historicity? A: If we had time, I'd like to know why you think that Neo's response is so lame. Be assured - I believe in resurrection! But I don't think that is necessarily what Job was talking about. Taken in context of the whole book - he's not very exccited about saying, "Yeah, it's OK that I'm suffering because in heaven it will all be better." Don't you agree? But listen - if you hear anybody taking my words as more than just one guy's honest thinking - which is tentative, fallible, and never to be taken as more than that - please tell them I don't approve! By the way - please be assured that I'm not trying to explain away hell! I'm trying to properly understand it's history, meaning, and use by Jesus and the apostles. An important distinction. I have been thinking about your commentary on the "threat" passages of Jesus in the gospels as a direct challenge to the rigid exclusiveness and marginalizing practices of the religious/political elites. In light of how this played out in the gospels, as a teaching Pastor, how do you see churches discipling Christians to be able to read the text this way. The difficulty in dealing with issue like justice, hell, mercy, and love seems to me a matter of how Christian are "disciples" or "formed". What practices can Christians encourage each other with in order to see Jesus' threats of hell in a more profound and challenging way that you have described in the book? I've never been all that comfortable with the oft-cited belief that the 'fear of God' is merely respect. Rudolph Otto's understanding of mysterium tremendum and the 'awefulness' of God seems to point to the flipside of the coin. And so I'm wondering: is there a purpose within the kingdom of God for such a 'fear of God'? How do we eliminate the fear of hell while retaining the fear of God? "If we had time, I'd like to know why you think that Neo's response is so lame. Be assured - I believe in resurrection! But I don't think that is necessarily what Job was talking about. Taken in context of the whole book - he's not very exccited about saying, "Yeah, it's OK that I'm suffering because in heaven it will all be better." Don't you agree?" (Job 19:25) But as for me, I know that my Redeemer lives. In the end, he will stand upon the earth. I recognize that until 2nd Temple Judisim there wasn't much talk of an afterlife. However, I think that in light of the relationship Job had (has) with God, and allowing that the text is God breathed and dare I say Inspired... I think Neal saying that Job was just hoping he'd 'get better' is lame. Things like the afterlife, or what is the Eucharist etc, shouldn't have easy answers. I mean you have such scholars as Luther and Zwingli trying to work out Symbol or Real presence? Then you get a scholar like Oecolampadius to come along study the Aramaic and figure out Yes. Bread and wine and also somehow Body and Blood. Still no easy answers. Which to me is how it should be. I don't think that Job was "offering up his suffering in the hope he'd be blessed in the next life" as much as affirming that there was a next life, that this valley of tears isn't all that there is... and even though the earthworms devour his flesh, he knows in the flesh he'll see God. I see echoes here of "What can separate us from the Love of Christ?" I don't see "It will all be better in the sweet by and by" Eternal Life starts now. Most helpful to me is the fact that you do an excellent job of showing what we're saved unto not just from.